Today Dubrovnik is part of Croatia, created after the breakup of the communist regime. The nasty wars of the Slav states in the early 1990s are now largely history with most of the damage repaired and prosperity, and holidaymakers in their droves, returning. Bosnia & Herzegovina, Croatia, Kosovo, Macedonia, Montenegro, Serbia and Slovenia today live in harmony each independent and keen on tourism. 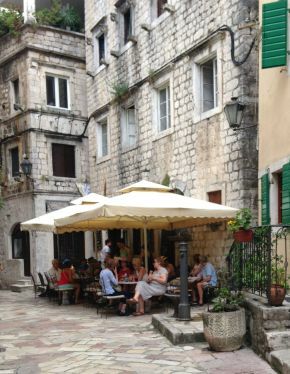 Our tale is not of Dubrovnik, but of Kotor, in Montenegro, just 60 miles away, tiny in comparison, also a walled city from the time when Venice dominated the Adriatic. In its own way it is even prettier and more interesting. Dubrovnik is the aviation gateway to Kotor from the United Kingdom and most parts of Europe. There are limited services to the capital, Podgorica, which has an airport. Montenegro is not part of the EU but uses the Euro as its currency. Croatia is an EU member, but has its own money. English is widely spoken. Stirling notes are popular too. The alternative entry is via cruise ship into the Gulf of Kotor, often suggested as the southern-most fjord in Europe, but in fact is a ria, a submerged river canyon. With steep mountains and pretty villages on each side the scenery reminds one of Norway, or Canada’s Inner Passage, but far warmer and with more habitation. If you are coming in by ship make sure you are up early. It is wonderful two-hour passage. The large liners cannot berth. The tender ride puts it all in perspective. The yachts of the super-rich are regular visitors and this was once a home port of the Austrian Navy before the First World War. Today a tired and leaking elderly corvette sits near a disused pier. The modern Austria is landlocked. 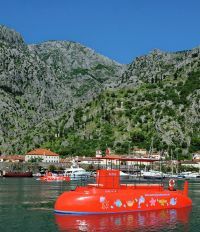 If you are into boats one suggestion might be a ride in the Montenegro Submarine, in truth a semi-submersible, the cabin located below water sea level with windows allowing the passengers to feel they are on a real submarine. The door on the upper deck remains so that visitors are also able to step up on the deck and enjoy the scenic ride. At the port entrance you will find the Kotor Open Bus Tour, but not your normal double decker. 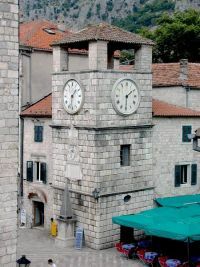 It is ‘hop-on hop-off’, the price (€20) including a walking tour of Kotor, and a 15-minute ride along the coastal road to the little baroque town of Perast with its Roman mosaics and museum. The beach at Bajova Kula is a popular getting off point along the way. 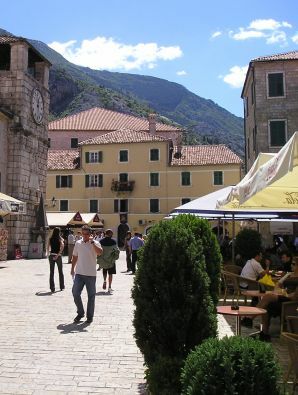 The old walled city of Kotor is a short walk from the port entrance, to the right, and is full of mediaeval mansions and free 21st century wi-fi. It is difficult to miss the information point. A UNESCO World Heritage site, the city was built between the 12th and 14th centuries and is filled with medieval architecture and historic monuments. Extending over four kilometres the walls that have protected Kotor for centuries lead up to the fortress of Saint Ivan. It is a long hard walk to the top, not recommended during the very hottest of summer months. Through the entire city the buildings are criss-crossed with narrow streets and squares. One of these contains the Cathedral of Saint Tryphon (Sveti Tripun), a monument of Roman culture and one of the most recognizable symbols of the city. The Prince’s Palace from the 17th century and Napoleon’s Theatre from the 19th century are all treasures that are part of the rich heritage of Kotor. 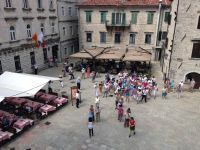 Whilst it may seem daunting at first it is very easy to wander around the narrow streets, popping in and out of courtyards, and taking in the heritage and warmth of the ancient vista. Montenegro‘s traditional cuisine is typically Mediterranean, with influences from other Mediterranean countries such as Greece, Italy and Turkey; but because of its geographical location, Montenegrin gastronomy also has links to Balkan countries. Walking around the city there is just one attractive looking restaurant after another, at prices those from the UK would not have seen for years. Called ‘palaces’ the mansions of the rich have for the most part been turned into boutique hotels featuring the ubiquitous wi-fi, full private bathrooms, air conditioning, and a 24-hour reception, as previously noted, with a real keenness to speak English.